210 bhp, 2,687 cc SOHC air-cooled horizontally opposed six-cylinder engine with Bosch mechanical fuel injection, five-speed manual transmission, independent front suspension with torsion bars, McPherson struts, and an anti-roll bar, independent rear suspension with torsion bars, trailing arms, tubular shock absorbers, and an anti-roll bar, and four-wheel disc brakes. Wheelbase: 89.4 in. After its successes in the Carrera Pan Americana of the early 1950s, Porsche attached the name “Carrera” to its highest-performance engines and production models. Although the name fell dormant after the last four-cam 356 Carrera left Zuffenhausen, it was revived with the introduction of the brilliant 911 Carrera RS 2.7 in 1973. With the introduction of the new G- and H-Series 911s, with their short hoods and impact bumper systems, Porsche continued the “Carrera” theme. While cars for the U.S. market were fitted with Bosch K-Jetronic fuel injection to help meet stringent new emissions rules, the “Rest-of-the-World” Carreras continued to enjoy the benefits of the Bosch mechanical system and its 210 horsepower. The MFI provided sharp throttle response and thrilling noises from the engine compartment and exhaust. Porsche built barely 500 “ROW” Carreras during the 1975 model year, making this one of the scarcest and most desirable high-performance road cars of its day. Power is delivered through a Type 915/06 five-speed manual transaxle and then transferred to the road via 7- and 8-inch-wide Fuchs alloy wheels that neatly fill its flared fenders and quarter panels. Large ventilated disc brakes, 11.10-inches up front and 11.50-inches in the rear, serve to haul the car down quickly and safely from speed. 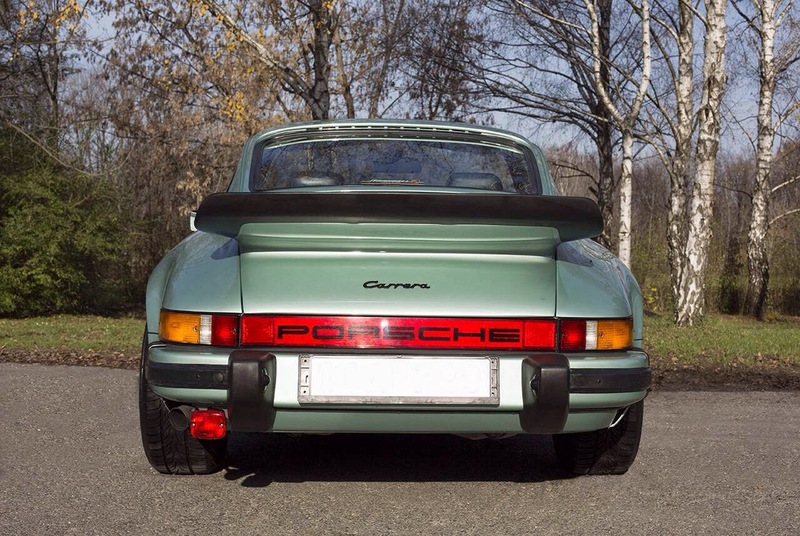 Carreras from 1974 and 1975 had almost identical appearances to the iconic 2.7 RS, although the earlier model’s rear “ducktail” spoiler had been upgraded with a larger “whale tail,” presaging those of the Type 930 Turbo Carreras that would follow. With its relatively light weight, at just over 2,369 pounds, the mechanically injected Carrera 2.7 is a brilliant performer, achieving 0–60 mph in just over five seconds and being capable of achieving more than 150 mph. This stunning example was delivered new in May 1975 through Mahag, the Porsche dealer in Munich. It is the 460th of only 508 H-Series ROW Carreras, and it appears to have spent its life in Sweden. 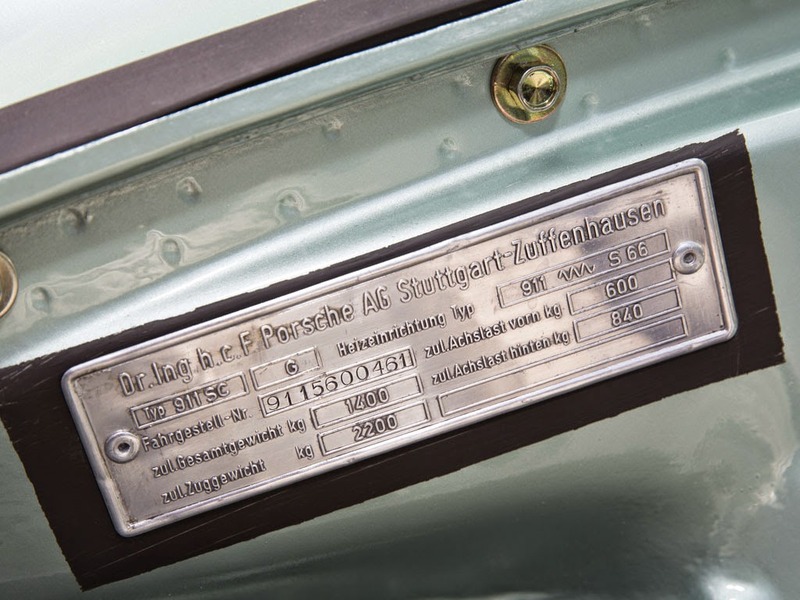 The included Certificate of Authenticity issued by Porsche Sweden notes that the original owner specified a wide-range list of extra-cost options, including headlamp washers, air conditioning, step-less adjustable intermit tend wiper control, a driver’s side sports seat and front passenger seat covered in black leather with perforated inserts, antenna suppression, a five-speed gearbox, colored windows, tinted glass, and a black perforated headliner (the “Triple Black” package). Also fitted were a dashboard speaker, two rear speakers, and a package of two front fog lamps and a rear fog light. The car wears a full set of special-ordered 7Jx15 Fuchs forged light-alloy wheels at the front and 8Jx15 at the rear. 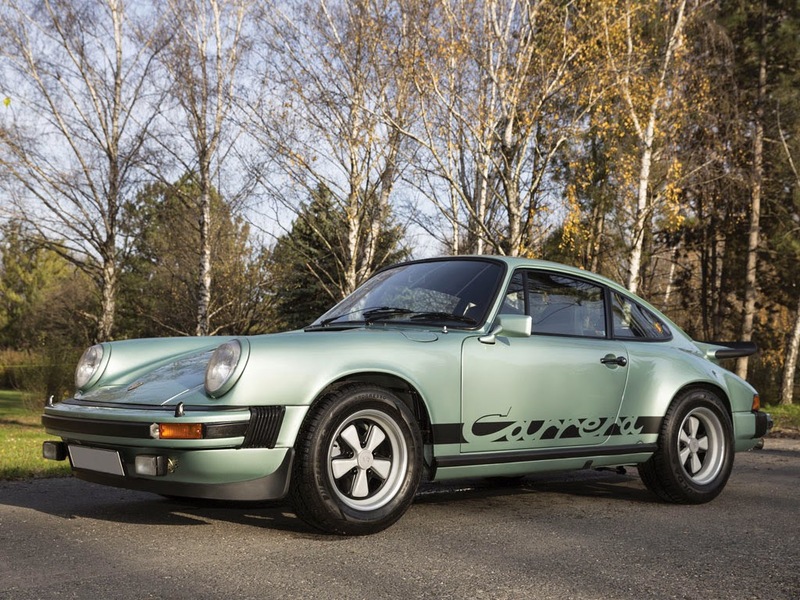 While the name of the original owner is unknown, the car’s second owner was well-known Swedish Porsche dealer Bo Strandell, who acquired it in the mid-1980s. Strandell sold the car in 1988 to a lawyer, Bertil Delborn, and at that time, approximately 70,000 kilometers were recorded on its odometer. Mr. Delborn drove the car regularly until 1990, after which he stored it in a heated garage and drove it only sparingly until 2012, when it was purchased by the consignor; at the time the consignor purchased the car, it had covered only 83,000 kilometers. During Mr. Delborn’s ownership, the car underwent mandatory government inspections in 1990, 2002, 2003, 2008, and 2011. A comprehensive, two-year, nut-and-bolt concours restoration was undertaken in 2012, by one of Europe’s top early 911 specialist shops. It included a complete disassembly, with all of the parts being catalogued, inspected, and refurbished or replaced where needed. The tub was stripped to bare metal and found to be in good condition overall, with some minor rust repair necessary, as would be expected from a 40-year-old vehicle; nonetheless, all of the body panels remain original. The body shell was primed using an electrostatic coating process, ensuring that the entire shell is fully protected from corrosion. It was then repainted in its original special-order color, Ice Green Metallic (code 250), which was applied using a downdraft spray booth with Glasurit paint. All of the tinted glass is original and in good condition. All seals and weather-stripping are new, and all trim, frames, door handles, and window frames have been newly anodized in black. Mechanically, the powerful 2.7-liter engine was completely rebuilt to as-new condition and appearance, with an extreme focus being paid to detail. A dynamometer test of the freshly rebuilt engine produced an impressive average of 214 horsepower. The five-speed, fully synchronized transaxle and braking system were both fully rebuilt, while the Koni shock absorbers were also restored before being reinstalled. All suspension bushing and ball joints were replaced. New 205/55 front and 225/65 rear tires were mounted on the car’s refinished original Fuchs alloy wheels. A fresh set of correct black “negative” Carrera appliqués completes the exterior. 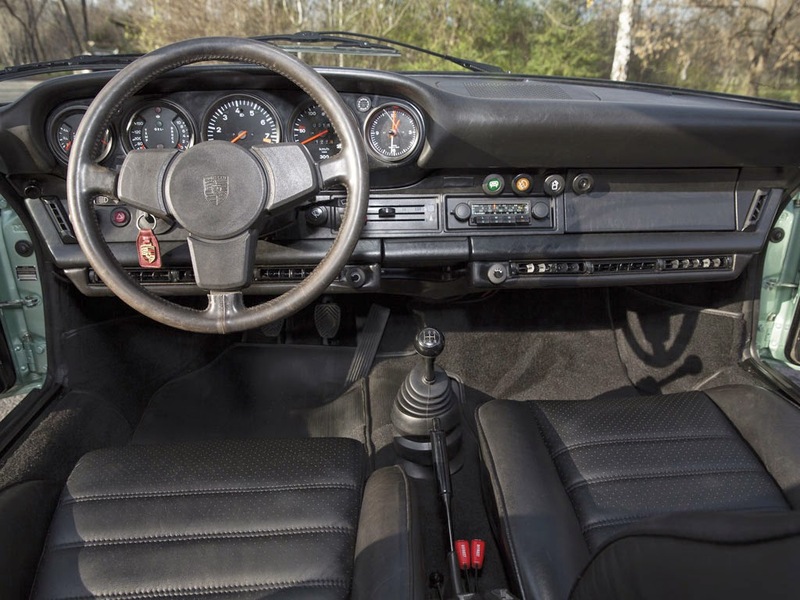 Except for new correct black velour carpets and a black headliner, the interior is the original, with a black leather sport seat on the driver’s side and a normal black leather seat for the passenger. The speedometer, tachometer, clock, and all other instruments have been carefully restored. The odometer was reset to zero, and the car will have approximately 1,500 kilometers since the rebuild. The radio is a new retro-inspired Blaupunkt-Köln example. 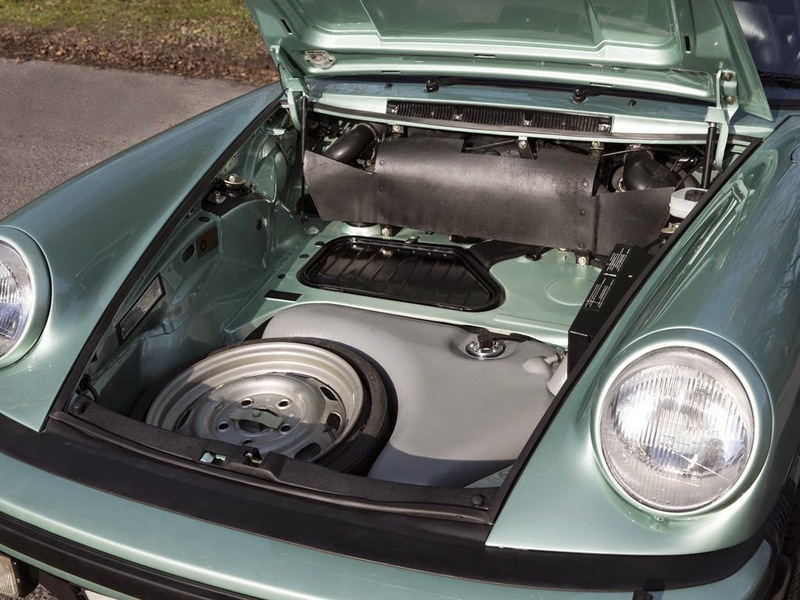 Additionally, the Porsche is supplied with its original tool kit, spare wheel, jack, and air pump. A detailed handbook that outlines the incredibly thorough restoration will accompany this Carrera at sale, along with numerous photographs that document the process. This beautiful MFI Carrera is offered in exceptional condition, and it would be a fine addition to any collection of rare Porsches, as it is suitable for both shows and touring.